Puzzle Room Escape-35 info about the game-Games2Rule. 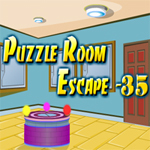 Puzzle Room Escape-35 is thirty fifth episode of Puzzle Room Escape point and click room escape from Games2rule. Use your cleverness and escape yourself from the puzzle room by solving the puzzles. Good luck and Have fun!